Even when we close our doors and go home at night, we're still just a point and click away. Island Blue's Customer Service Centre provides clients with 24-hour access to our services. From here you can request an estimate, place an order or transfer a file, all from the convenience of your office or home. Want to know more about what we can offer your next project? Just select your destination from the provided links to get started. From personal photo calendars for your friends and family, art cards to showcase your newest creative endeavor, even wine labels for this year's backyard harvest, you don't have to be a business to take advantage of what's available at Island Blue. If you don't see what you need, just contact us to find out what we can do for you. 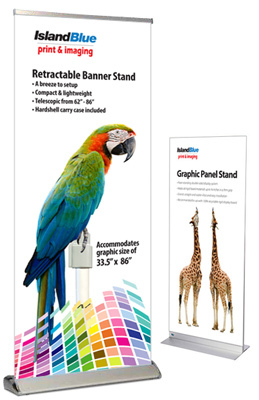 From a 6 colour eco-friendly solvent ink printer, Island Blue is capable of producing wall graphics up to 60” wide on a variety of materials such as point-of-sale posters, floor & window graphics for retailers, banners for trade shows, canvas and fabric for set displays. 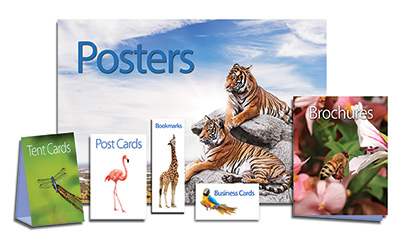 Island Blue produces big, bold, photo-realistic colour graphics and images for indoor and outdoor posters and banners. For retailers, whether you need a single point-of-sale retail poster or a large quantity for multiple locations, our wide format colour printers are capable of printing to a wide range of materials. Island Blue offers a variety of print and marketing signage for the Real Estate market from metal Step Stakes sell signs to durable and re-useable A Frames. For the Construction industry, smaller format site signs are available to promote your company all the way up to large format site boards promoting the new project. Island Blue offers Architects, Engineers, Building Designers and Contractors superior quality black & white digital bond prints from digital files of building drawings and plans. Trade shows are all about getting information of products or services you offer directly into the hands of prospective or existing customers and vendors. Island Blue offers a variety of display units to meet your trade show needs. Besides trade shows, a number of our banner up stands can be used in boardrooms, show suites or entry lobbies as a promotional tool. 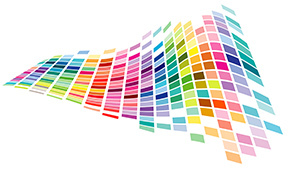 Printorium Bookworks offers short-run printing of B&W and full colour, perfect bound books. Visit this section right now and find a wealth of information that will help you get your book ready for print. Whether it's one copy or ten thousand, printing what you need when you need it keeps your overhead and inventory down while still keeping you prepared for your business needs. From forms to booklets, from manuals to flyers and hand out sheets, our high speed printers can be your answer.